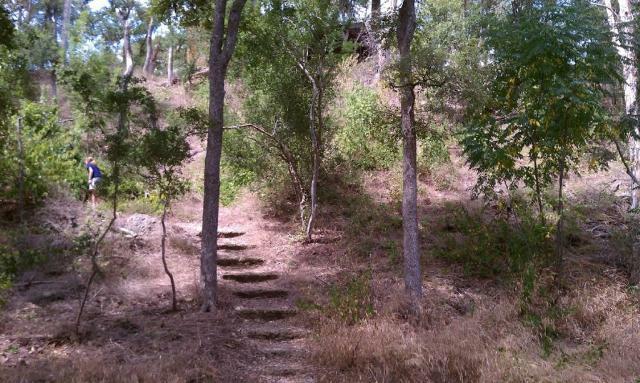 The main trails were well maintained and wide enough so that you wouldn't have to push through grass or brush. Though small by state park standards, Lockhart State Park includes a number of named trails that snake around the golf course that draws the majority of the park's visitors. We started our hike at the recreation hall at the end of Park Road 10. Caddy Trail starts south of the recreation hall and heads south, trending downhill back towards the road. 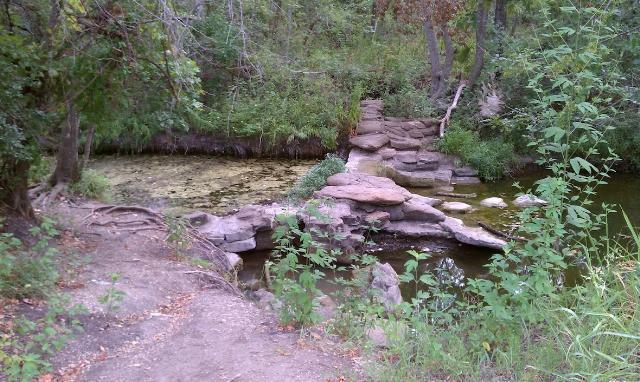 The trail here is not terribly well maintained and the going is a bit rocky. The rock on the path though reminded me of the stonework done by the Civilian Conservation Corps for many of its structures so I'm wondering if some of the rocks here are leftovers from the CCC's construction work. The Clear Fork Creek trail starts by crossing the creek on one of the many CCC era dams that can be seen along the trail. When the trail crosses the road it turns into the Chisolm Trail and the going gets a bit better. The trail is wider which means less pushing through grass or brush and gathering up some chiggers on the way. The soil along parts of the trail tends to be slightly sandy, which provides the perfect environment for ant lions. Some sections of the trail almost look like they'd undergone bombardment from a collection of micro meteorites due to all of the small crater-like traps that the ant lions had laid out. A couple of side trails and loops lead off from Chisolm and Fence-Line Trail once the trail turns left at the park boundary. The side trails are a bit more like the Caddy Trail in that they are more prone to overgrowth. 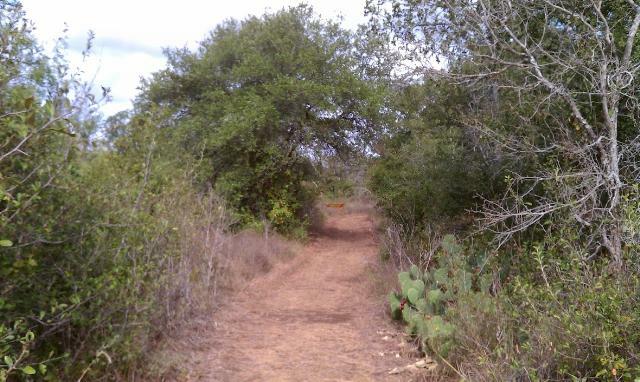 One of the side trails, Persimmon Trail, is aptly named. It contained a larger collection of very large Persimmon trees than I think we've seen anywhere else. The conditions here must be ideal for their growth. The CCC Trail leading up to the recreation hall at the top of the hill was overgrown and hadn't seen much maintenance recently. This section was a bit better than most. 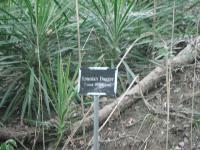 The park features a number of markers showing some of the native flora in the triangle of trails in the southeast quadrant of the park. An interpretive guide is available at the park entrance. Though not listed in the guide as a native, we were still surprised to see a few invasive Chinaberry trees marked on the trail. We thought such an invasive plant would have been cut down in a state park and not highlighted. At the other terminus of Park Road 10 where Hilltop and Creekview ends Clear Fork Creek begins. It's starting point is a traverse of one of the many CCC era dams that line Clear Fork Creek. 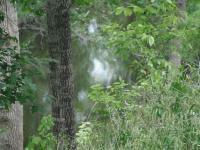 Clear Fork Creek follows the creek towards the northwest and is very overgrown in places. It looks like it hasn't had much attention lately. Once you've come to the end of the trail you'll be dumped off on Park Road 10. One can double back at this point, but the other option is to turn left and walk along the road a bit looking for the last trail on the right. The CCC Trail is a short path leading up the hill towards the recreation hall that was our starting point. This trail was also overgrown and in need of maintenance. It was also in some ways the most interesting in the park due to the stairs, ledges and railings that had been put into place. All told, we managed to log over 3 miles during the day with not much doubling back. This turned out to be more trail than we were expecting and a bit rougher than we thought it would be. Most of the trails are very well maintained and easy. The Caddy trail was pretty rough and not maintined like the others. Lots of evidence of wild hogs. Lockhart State Park is an interesting park in that it has a golf course within the boundaries. There are several hiking trails that form a "tangled mess" that run through the park, take you along a creek and past an old CCC building built in the Depression Era. There are also a few hills to negotiate that give you some cardio work, but nothing major. The trails are well-marked and easy to follow if you get a printed trail map from the Park HQs. Coppertone and I were not expecting much but thought we should still get this trail logged. It turned out to be better than expected, even if some of the minor trails were overgrown, much to Coppertone's consternation. Though we expected only 1.5 miles of trails here the total was more like 3 and with some doubling back that we did as we mapped the trails we ended up hiking a bit more than that. We only saw four other people on the trail. We saw much more on the golf courses when they came into view now and then. We also enjoyed looking at the old recreation hall and old swimming pool that had been filled in. The first trail along the creek deadends but if the water is not too high you don't have to back track too far to cross the creek to get to the other trails. If you do the main loop around the outside of the park you will have a much easier time tring to follow the trails if you just remember to stay left, don't go too far on the western end of the trails (look for the right turn after the last side trail on the map, but it looks like you can go straight), go left at the gofl coarse and around the gate, when you get to the road the path is across the road to the left just look for the place were water has started to erode the hillside that is the path. There will be a few steps at the top. The scenic spot isn't worth it and the path back is all paved.